Do you own an LP of Joyful Jazz by Father Tom Vaughn? If so, click here. I am missing a spoon. It is silver, and should have IKEA stamped on the back of the handle. It’s highly possible that I accidentally took it home or that it is actually in my office somewhere, but hopefully someone else just picked it up after I forgot it in the sink. 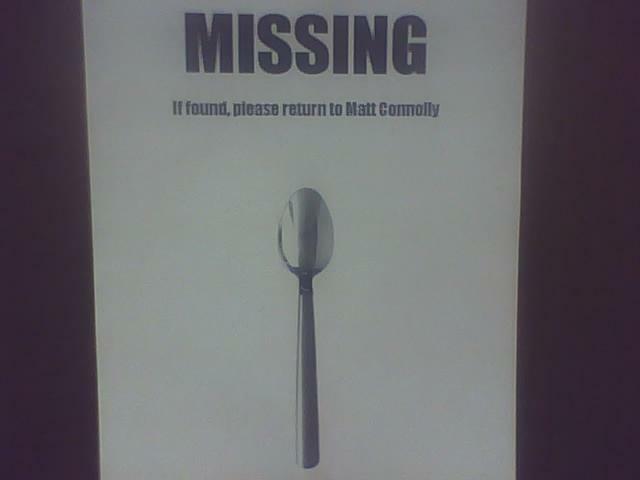 I am very particular about my spoons, please let me know if you have it. I appreciate the effort. Really. However, I can’t even tell it’s my spoon. 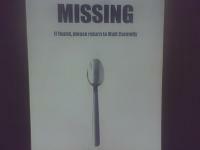 It could be just some spoon that looks like mine. 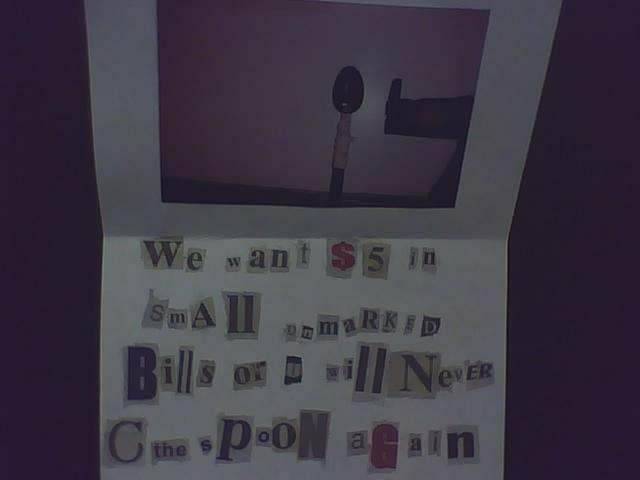 Unless I can actually talk to the spoon and confirm that it is mine, there is no deal. 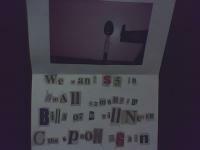 Also, ransom notes generally list details like where I should leave the money, but still, A+ for effort. We’re planning to go to IKEA in a few weeks, and I think I should just buy a dozen spoons in case my replacements are stolen. I’m a little concerned that I’m being followed. You see, when I used to go running in Morningside, there was this dog. I never actually saw this dog, but I did see the ‘results’ of his presence quite regularly in the middle of the sidewalk. I just couldn’t understand how anyone could let their dog lay a load in the middle of the sidewalk and then not clean it up. I finally came to the conclusion that this was an ownerless dog and that he roamed the neighborhood freely relieving him(or her)self all over the place. I regret to report that this phantom wandering neighborhood dog has followed us to our new house. I’m sure he (let’s just go with that pronoun since we know that no self-respecting woman would do that) has been letting loose out on the streets since we moved, but I was very pregnant for a very long time and then I was completely exhausted from the process of becoming unpregnant for a very long time so I didn’t have the energy to roam the neighborhood. Because I have been convinced to run the half-marathon on Thanksgiving I am roaming the neighborhood streets quite regularly and I’m here to tell you that our friend has returned. Every day he leaves a new gift and I spend the first full loop of each run looking to see what he’s marked since the previous run. There’s always evidence of his presence and unfortunately it never rains anymore. Forget the plants and Lake Lanier, the real crisis is the poop buildup on our streets. Do phantom dogs respond to restraining orders? That’s as long as I could watch the Atlanta Press Club Debate that was on tonight before we had to turn it off because Matt was afraid my head might explode. I find it extremely helpful that you just called me to let me know that I would be receiving a package tomorrow for which I will need to sign. I also find it helpful that I can’t change the delivery options until there have been several attempts to deliver the package. What I find the most helpful, however, is the fact that you gave me a time frame in which to expect said package. In case you have forgotten that time frame is 8am-7pm. This will work well for me because I simply don’t have anything else to do during those hours. Lastly, when you come it would make my day if you’d ring the doorbell and wake my sleeping son. I love that. I am impressed with your newfound ability to move freely about on your own terms. I am also (and have always been) impressed with your ability to vomit large quantities of anything that might be in your stomach without any warning (and more often than not, with a smile). More impressive still is your ability to pull a vomit sneak attack and do it on the fly, leaving a puddle for us to find later in (sometimes very unpleasant) different ways. So it would stand to reason that I am most impressed with your ability to combine your talents and pull a vomit sneak attack while crawling leaving an impressive trail of vomit throughout the living room. Now I know for sure that you are destined for genius. My brilliant husband just called to say that he passed the first test that’s necessary to get the certification he’s going for. There are two required tests for the first level of certification and the test he just took was the one that he felt would be the hardest, mainly because the applications he was being tested on weren’t things he uses very often. His plan is to take the second test required for certification as soon as he can, take a break for a while and then move on to the second level of certification. If this is hard to understand, I apologize. I have had to ask Matt no fewer than 3 times in the last couple of weeks to explain it to me, so at least you’re not alone if you don’t quite get it. If you do get it, congratulations to you, you’re smarter than I am (this is not as big a deal as I wish it were) but the real congratulations should go to Matt! Liam is getting better at the crawling thing. Last night Matt and I watched as he crawled about 6 feet to get to the vacuum cleaner cord across the room. It appears that all we need to do to get him crawling regularly is cover the house in potential hazards and he’ll get the hang of it right away! I can’t decide whether it’s our oven I hate or whether it’s the Hormel company I hate, but one of those has caused the current situation in which I put a pork roast in the oven over an hour and a half ago when the package said it should take 45-50 minutes and the dadgum thing’s still not reached 160 degrees.